Our Largest working area of any scaffold tower system we stock. 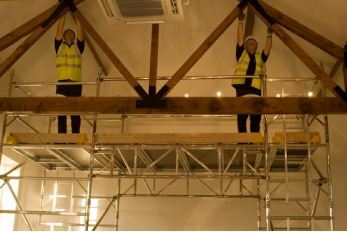 Aluminium beams which link two BoSS Ladderspan or Clima Access Towers to provide large uninterrupted safe working area. Why Bridge Beam Scaffold Hire ? The bridge beam scaffold tower is great for construction professionals who are working on sites with huge ceilings that need plaster boarding or fitting with a suspended ceiling. £50 addition to the scaffold tower price. The equipment is also ideal for professionals who need to fit huge beams in the ceilings and they need a steady, secure platform that is easy to erect. The bridge beam scaffold tower hire does what it says on the tin. It offers a huge working area by effectively joining two standard scaffold towers to form a long wide bridge. This means that the size of the standard scaffold tower can be quadrupled offering a large safe uninterrupted platform to work from. Just like the standard scaffold towers it fits on to, the Bridge Beam Scaffold Hire tower is very easy to construct and it helps to eliminate the risk of injury and accidents. The bridge beam scaffold tower can even be used over conservatories and other immoveable objects when you need direct access overhead. The standard scaffold tower offers an easy-to-build system using coloured braces which lock into place so it can only be put together safely and correctly with no errors and you don’t need special tools or experience. Working at height is an occupational hazard when it comes to the building and construction industry. Health and safety is at the forefront of all good construction professionals concerns and sometimes you need a little extra help when it comes to reaching those high areas. With statistics from the HSE showing that falls from height are the most common cause of death and injury in the industry, it certainly pays to make sure you have the right equipment to get the job done with minimum of risk. A first-time user should easily be able to erect this scaffold tower within an hour.